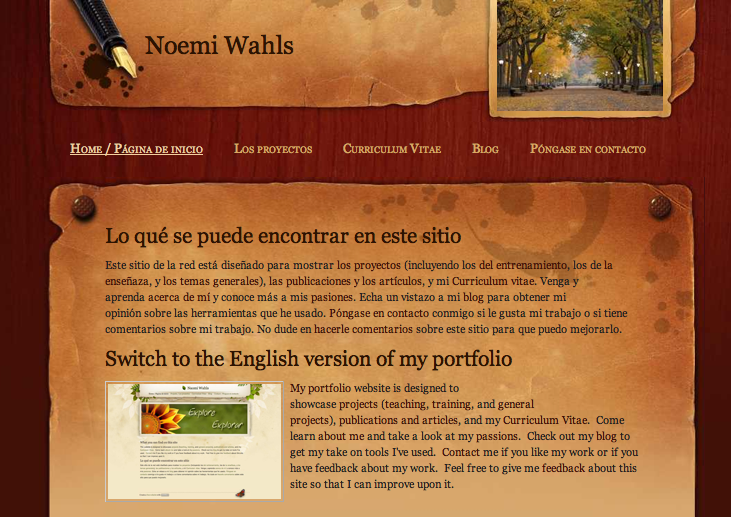 This website is designed to showcase projects (teaching portfolio, training, and general projects), publications and articles, and Curriculum Vitae of Naomi Wahls. I'm an external PhD Candidate at Open Universiteit, Netherlands, researching Open Virtual Mobility (OpenVM) through Intercultural Collaborative Open Learning. I'm an American-Luxembourgish who specializes in global online education, instructional design, language teaching and learning with technology, and social media marketing. Come learn about me and take a look at my passions on my bio page. Check out my blog to get my take on tools I've used. Contact me if you like my work or if you have feedback about my work. Feel free to give me feedback about this site so that I can improve upon it. Este sitio de la red está diseñado para mostrar los proyectos (incluyendo los del entrenamiento, los de la enseñaza, y los temas generales), las publicaciones y los artículos, y mi Curriculum vitae. Venga y aprenda acerca de mí y conoce más a mis pasiones. Echa un vistazo a mi blog para obtener mi opinión sobre las herramientas que he usado. Póngase en contacto conmigo si le gusta mi trabajo o si tiene comentarios sobre mi trabajo. No dude en hacerle comentarios sobre este sitio para que puedo mejorarlo. Portfolio - Naomi Wahls by Naomi Wahls is licensed under a Creative Commons Attribution-NonCommercial-ShareAlike 3.0 Unported License.